Architect Michael Patrick of Barnes Vanze talks about how a 1980s Columbia, Maryland office building was transformed into an open and welcoming headquarters for the North American Division as it leaves its old home in the General Conference. Question: How did Barnes Vanze Architects get the commission for designing the new headquarters of the North American Division of the Seventh-day Adventist Church? Answer: Simply put, we competed with other high-quality design firms for the work based on our qualifications, a proposal booklet we submitted, and an interview. We were pleased to be selected and began work right away. Do you know how you were chosen? The above process allowed us to present our work and ourselves to the NAD’s Ken Denslow, assistant to the president, and Jim Walker, director of facilities. I think we had a good connection personally and were able to show that we combined knowledge of the building type and project with a highly developed sense of quality and detail. I also knew Jim Walker from having worked with him previously at other institutions, so I think there was a high level of trust there. On a project like this, that from the start had a somewhat undefined scope and a very fast schedule, there needed to be trust because so much can go wrong. You have to know that on a day-to-day basis you can work things out as they unfold in a dynamic fashion and that everyone is going to work to help the others — not to protect themselves. Finally, although our design team had and has every variety of religious or non-religious outlook, I personally have a sympathy for the religious mission of the Seventh-day Adventist Church and was happy to be part of helping the SDA Church and NAD improve its ability to carry out its mission. And why else did you want the job? Many reasons: I knew from working with Jim previously that it would be a productive process that would allow us to do great work. Also, our firm does unique and interesting projects for discerning clients, and more than most commercial office building projects, this one offered opportunities to do beautiful work that serves a demanding functional need supporting an important mission. We also have found the Seventh-day Adventists to be a good group to work with and thought we would be happy at the end that we had done this project and built this relationship. What were two or three of the biggest parameters you started with as you began the design work? We were given parameters, and we helped define the parameters, and the parameters grew and developed as we went along! It is useful to recall that just as the NAD was undertaking its first major building project, it was also emerging out from the big tent of the General Conference facilities for the first time, and it had to figure out — quickly — what kind of food service it really needed, what kind of storage, what kind of security, what kind of vendor contract structure to create, etcetera, etcetera. It was quite the undertaking! All if this happened within the last 21 months! Importantly, one of the parameters that we established early on was that three-way communication link between Jim Walker (who was in charge of the implementation of the project), Ken Denslow (who, as assistant to the president, had an administrative overview of project goals and NAD needs), and me, architect and representative of the design and design team. This link was set up by Jim. I learned early on from working with Jim the power of having a strong core of three leaders representing the facilities, the administration, and the design. There was an initial set of space needs parameters. We knew from the beginning that the NAD wanted a new, large meeting space that ideally could accommodate 500 people. We knew there would probably be some sort of TV studio space. We knew security would be important, hand in hand with openness and transparency, and that the existing front lobby already offered great opportunities for that. We knew the mission that included health would drive a need to have exercise space and a building that could allow people to walk for exercise, and we thought there might be some sort of food service but maybe automated in vending machines. We also had some ideas about uniting the various departments and giving them a sense of individual homes as well as inter-connectedness. We understood that openness and transparency were of very high importance as a way to be welcoming and encourage participation. We also knew and learned as much as we could about the Seventh-day Adventist Church and the NAD and sought to understand any other qualities of design that would best demonstrate the spirit of the NAD to everyone in the building and create the best environment for fulfilling the mission of the Division. At the beginning, however, these were very general and sometimes loosely defined ideas. Therefore, we undertook a robust “Programming and Visioning” effort. The programming effort was a highly structured process built around three rounds of meetings with different constituencies within the NAD, from President Dan Jackson and the Admin Group, to the directors of all the departments, to a meeting open to a larger group of NAD staff. Each meeting gave us a chance to listen to the needs and concerns of the staff and administration of the NAD, so that we could tailor the design of the building to meet those needs. We also created detailed survey forms (“Departmental Work Sheets”) for each department to respond to, asking for everything from number of staff now and anticipated in the future, to storage needs and meeting room use patterns. We created Common Space work sheets to help determine the programmatic needs for spaces shared in common by all staff and all departments. At the end, we compiled all this information, along with small test layouts of all department concepts, into a single (quite thick) programming book that was a guide to the design for the rest of the project. Were there other things you did to learn as much as you could about the Seventh-day Adventist Church and the North American Division? Did you read about the church's history? Attend services? Yes, I read about the history of the church, and I talked to Jim and Ken and others about it. We discussed some of the paintings and artwork in the General Conference and their meaning. I haven’t ever attended a service although I would be happy to! I believe there are 120,000 square feet of office space in the NAD’s new building, and you mentioned the auditorium that seats 500. This contrasts with the 35,000 square feet that the NAD had in the General Conference building. So space was an important thing you had to work with, right? Yes, the building was 116,600 square feet, and the added atrium brought that up to 119,116 square feet. There was already a sloped floor auditorium-type space that seated 122, but the NAD needed a much larger space to seat about 500, so we added that. There was a very nice, recently renovated business center which was ideal for use as a visitor’s center with minimal updating. The building in its previous incarnation was able to house several hundred personnel but with limited meeting and special spaces and not enough restrooms. (The building was owned by Nielsen, the group that does surveys and projections on trends. Nielsen still owns several buildings in the area.) This allowed the NAD to insert the large 500-seat Charles E. Bradford Auditorium, pre-function space for it, and a Green Room, more restrooms, exercise space, a TV studio, mail room and shop, a commercial kitchen, and many meeting spaces to support the smaller number of staff that entered the building on move-in day. As staff may grow over time, however, there is some room to accommodate that due to the building’s significant size. What a pleasure it was, by the way, to see Charles Bradford himself at the grand opening of the building on October 27! Were there unusual challenges or obstacles to converting the original 1980s building? Yes, yes, and yes! Some very practical: by inserting large assembly-type spaces into what was previously a building full of office space, the building was suddenly subject to new and more stringent code requirements. Fire protection that was adequate for floors full of offices was not adequate for rooms full of large numbers of people, and walls and ceilings had to be removed to add fire protection. Adding the atrium transformed the building by opening it up but made meeting egress codes more demanding, resulting in various design solutions. Other challenges related to the design. The very interesting curves of the building, especially in the atrium area, are achieved by virtue of no two sides or radiused corners being the same in the existing building. Trying to design the trusses and glass roof to cover such a space, in which no lengths or angles are equal, was quite a challenge. I think we succeeded though. Believe it or not, what is now the beautiful auditorium space, where the grand opening took place, was previously a call center, with a warren of tiny cubicles, odd drywall soffits and furr-downs, and huge column enclosures. Storm drain and plumbing pipes had to be moved and work done in the slabs and over ceilings, just to make this space possible. A great deal of the hard work behind the design of the actual workplace, where people spend most of their time, was done by Jim and Ken and their team. While we were focusing, by necessity, to some degree on the atrium, auditorium, and other new spaces we were making, Jim and Ken drilled down repeatedly into the needs of each department and how worlers would best be satisfied within the parameters of the spaces the existing building had to offer. We offered comments and advice, but at the end of the day, there were so many moving parts that Jim’s work was critical to getting this right. As that began to gel, we offered our expertise to help organize groups of offices to form cohesive and pleasant spaces to work and move in. We reviewed endless lists of people and departments with Jim throughout this process! I would also like to mention Katie Grier and Washington Workplace who provided the work stations and furniture in the building. Katie’s work enhanced the design of the building immeasurably, and to a large part, defines the day-to-day experience of many in the building. We love the furniture! I understand there was a large tree, and that is what you created the atrium around? The idea came up as the new Charles E. Bradford Auditorium was starting to take shape. Spaces like this need a kind of “pre-function” space where people can gather before they go in to a big event and where people can be checked in, given conference packets, and so on. Try as we might, the original existing building just did not have a place that really worked well for this function. Previously, where the existing floor of the current atrium is, there was grass, some drains, some poorly maintained low walls to sit on, and one large tree. While the intent was noble, the actual effect was a little bit dreary, and that space was unusable most of the time. On the second floor, where the new terrace seating is, there used to be an outdoor balcony. It was accessible, but it was also run-down and surrounded by dark glass and hard surfaces, so not terribly pleasant. It came to me that the area of the tree well would be perfectly placed and would be the only space with adequate size to meet this functional need. It would also link the first and second floor as one community, provide more convenient walking space for daily use of the building, and provide places for eating on the second floor that would be wonderful socializing space. The minute I brought it up, though, I said: “But to do this will take quite a bit of effort and resources.” It was Ken Denslow who saw the potential of the space as the heart of the building and wouldn’t let it die, even when time and money seemed in short supply. The addition of the atrium lengthened the design and construction process significantly and complicated the permitting of the building substantially as it is the only real new ground-up construction on the project, but it seems evident to all that the result was well worth it. This turned out to be a great marriage of function and form. What did Jim Walker and Ken Denslow tell you were their biggest priorities when designing the NAD’s new headquarters? We were guided to understand that the new NAD headquarters building exists to support the churches, schools, hospitals, and other missionary works of the member churches of the North American Division. Everything was ordered toward this goal. We understood that we would be successful if in some way the new building allows the NAD to increase the number and effectiveness of its missions around the world. The words “transparency” and “openness” were used frequently, as a general guide to the design and a very high priority for the NAD. We felt that this was part of a sense of “welcoming” that it was important for us to design into every part of the building. We did quite a bit of visioning work to help clarify the NAD’s priorities, including exercises we call “Image & Atmosphere,” “Post Cards,” “Identity & Service,” and generation of a vision and goals statement for the project. Each of these is designed to capture some of the intangibles that make a design appropriate for the specific group of people it is designed for. All of the exercises not only give us direct insight into what is important for the institution but also provide an opportunity for us to hear the key staff and decision-makers discuss among themselves what they think is important in response to questions they may not already have prepared answers for. We find this very insightful. Naturally, in setting the vision for the project, we began with the NAD’s own vision statement: “To more fully bring Christ's message of Hope and Wholeness, through the North American Division's own historically formed character and spirit, to the uniquely diverse membership that the NAD serves in its regions and across the world, in a way that welcomes, encourages and enables ever deeper participation by all." So is the building now uniquely "Adventist" in any way? I very much hope so because that is always our goal! The four floors are meant to embody Healing, Teaching, Ministry, and Discipleship. We created strategically located places for graphics and artwork to portray the seven days of creation and other theologically important lessons around the building. Would you say that theology informed the architecture at all? Except for the chapel, where theology is explicit in the stained-glass artwork of Christ the Good Shepherd, the building’s strongest connection to theology is to be a place where the missionary work of the Seventh-day Adventist Church can be carried out more fully and effectively. As noted above, and given the long-term commitment of the Seventh-day Adventist Church to using modern technology to convey the message of Jesus Christ, flat screen monitors are positioned throughout the building to allow this message to be conveyed in ways appropriate to each day and time. We had long discussions about how to integrate the spirit and theology of the Seventh-day Adventist Church into the building. As we were re-purposing an existing building, and not building a church building per se, it did not make sense to try to give it a church-like form, but we did attempt to find opportunities for the theology to be expressed on a daily basis. The openness and transparency of the building were fundamental to the design because they support the goals of increased participation and welcoming, which we understand to be fundamental to Seventh-day Adventists. This is not specifically theology, but does provide an environment that supports the theology of the church. A stained glass mosaic is the focal point in the C.D. Brooks Prayer Chapel. How "green" is the building? The renovation did everything practical in a short time frame to improve the sustainability of the building operations with room for ongoing improvements as time and budget will allow. All the existing lighting was converted or replaced to LED lighting. Daylight sensors for lighting were either already in place or were added to allow lights to power down when natural light is adequate. Occupancy sensors were already in place or added so that lights don’t remain on when not needed. A Building Management System was installed to monitor and improve HVAC efficiency. A substantial new heat-recovery HVAC unit was placed on the roof to lower energy use and costs. All new HVAC equipment is gas fired, and new gas lines were installed to bring gas to the building for this purpose. At some point in the future, when feasible, the terminal units serving air to all spaces — which are currently electrically heated when some extra warm air is needed — will be replaced with gas units, which will save energy. A serious effort was made to install solar panels as shading over the cars in the parking lots. While not feasible in the current time frame, this and other ideas are very much a part of the future of the NAD’s new headquarters building. How long did the design and then renovation take? The project moved extremely rapidly and was completed faster than normal even with some last-minute delays getting everything wrapped up. There was little more than one month between when the existing building was purchased in early December of 2015 and when we had our kickoff meeting in January of 2016. A process of issuing a Request for Proposals, receiving proposals, interviewing firms, selecting firms, and organizing for the kickoff meeting, which normally takes months, was completed in this very short time frame. As mentioned above, the project was delivered more quickly than normal through the use of several creative project delivery strategies. The first was the issuance of multiple packages. Where normally projects are designed, engineered, and documented as one complete effort, then bid once by a set of general contractors, and then constructed in one effort, this project was accelerated by breaking the scope of work into three packages. Because the prior tenant was not leaving the building immediately and because the exterior work did not require much programming, sincr it was mostly repair and refresh work, an exterior work package was issued early in the process. Then, while the interior of the building was still being designed, a package related to interior demo was issued so that work could be completed ahead of time. Finally, a package with all the interior work and the complete atrium was issued. This leads to the second strategy, which was a “fast-track” process where new drawings were issued on a regular basis as designs were completed, to try to stay ahead of construction. There was so much ongoing highly detailed information being processed and included in the design as time went by that even through most of construction new design drawings and document sets were being issued. Additionally, in order to control schedule and reduce costs, the work was broken up among different contractors, including work self-performed directly under the able direction of Jim Walker on behalf of the NAD. The interior work was, for example, done partly by PWC General Contractors and their subcontractors and partly by the NAD and its own subcontractors, and there was an intricate dance coordinating the two. The sum total of all of the above allowed the project to be delivered in time for the 2017 Grand Opening, which is remarkable when you know the history of how the NAD had, in some ways, to define its own needs during the process. How big was the architectural team? There was a large project team of many different companies and organizations, including civil and structural engineers, mechanical, electrical, plumbing, waterproofing, various consultants, and many more. The Barnes Vanze Architect team itself varied depending on tasks and was usually at least two or three people, and at crunch time for deliverables could be five or six or more staff at one time. I would especially like to mention Ellen Hatton, who helped manage the project in our office from the beginning, and Sydney Katz, who took over that role and also was the main person pushing and coordinating all the work toward completion as deadlines came one after the other throughout the process. She was well-liked and respected by owner and contractors alike, which is quite a feat! Have you done similar jobs previously? Yes, including a long career of leading the design of large commercial and institutional projects. These have ranged from as little as $1 million up to $100 million-plus buildings and $300 million-plus campuses of buildings. The firm has always worked with the assumption that the design of the interior workplace is as important as the design of the major public spaces and exterior of the building, so we pay close attention to interior architecture and design. What did you most enjoy about the project? I most enjoyed the opportunity to be part of creating a place that makes the lives of everyone working there better. I’ve heard people talk about how much they like to come to work in the new building. That makes everything worthwhile. For me, and all of our team, the opportunity to do work that is beautiful and meaningful is also very important. For us, work can only be beautiful and meaningful if it also fundamentally supports the mission and work goals of the institution, so the opportunity to solve some interesting technical and functional challenges was also enjoyable. Trying to meet a fixed schedule with an undefined scope of work was the most challenging part of the project from start to finish. The schedule did bend and accommodate at significant points: the addition of the atrium clearly required a longer time to build; an unusually lengthy permitting process also pressed the need for more time; and in the end wrapping up the work as the scope of work slowly clarified took more time than anticipated. Changing one thing on a drawing after the multi-firm design team has finished coordinating something always opens up the possibility of something being missed during construction. Simply because of the nature of the effort – quickly giving the NAD a new home while the NAD was itself figuring out its own needs – the changes were constant and lasted deep into the construction phase. It is a testament to the goodwill and trust of the whole team that the project was completed well and on time for the grand opening. It is also a testament to Jim Walker’s good work, which I know for a fact included more late nights than I care to know about! It sounds like you had a really good working relationship with the NAD. We found the NAD to be a great client. We started with a reservoir of trust that continued throughout the process. Everyone we worked with was cheerful to the point of being joyful. Ken and Jim treated all members of our team with respect and did everything they could to help us do our work. The joy evident in the grand opening was something we felt throughout the entire process. Also read Spectrum's coverage of the grand opening and an interview with Dan Jackson about the new building. 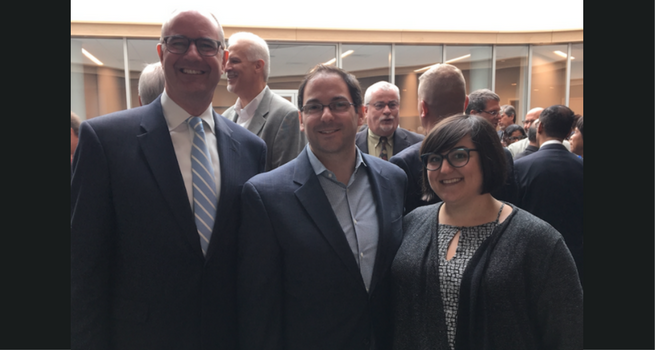 Main Photo from left to right: Michael Patrick (Barnes Vanze), Matthew Memberg, Structural Engineer with Keast & Hood, and Sydney Katz (Barnes Vanze) standing in the atrium after the grand opening. Photo courtesy of Barnes Vanze. Additional Images Courtesy of Pieter Damsteegt/NAD and Alisa Williams/Spectrum (as noted).